Head into the depths of the wilderness and remain dry during springtime storms with this lightweight Gore-Tex hooded shell that features a waterproof, windproof construction with fully sealed seams to create an impenetrable barrier. 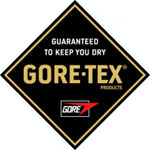 Gore-Tex® Paclite Shell - Introduced in 2009, this exclusive Paclite® membrane is laminated to lightweight, strong nylon textiles to produce garments that are extremely breathable, compressible and durably waterproof. This membrane contains a protective black layer that is made of an "oil-hating" (oleophobic) polymer and carbon that allows perspiration vapor to pass through, but prohibits body oils, cosmetics, salt water and insect repellents from altering the waterproof qualities of the membrane. Extremely compressible, this fabric packs extremely small.